Our popular Stefano Rome Tours countryside tour "Castles and Lakes" is now also available as a Post Cruise Excursion with pick up at your ship in Civitavecchia and drop off at your hotel accommodation in Rome. This this unique tour into Rome’s beautiful countryside will take you on a fascinating journey through three significant eras in Italy’s long history that have contributed to Italy’s treasures and greatness: the Ancient Etruscans who greatly influenced the Romans, the Medieval Era with historic hilltop hamlets, and the Renaissance Era with elegant castles and precious works of art. Pick up time: Your English speaking driver will meet you on the pier by your ship at 9:00 AM. Your luggage will travel with you and remain safely inside the vehicle with your driver while you are sightseeing. Post Cruise Castles and Lakes Tour is NOT offered on Mondays as the Banditaccia Etruscan Necropolis is Closed on Mondays. 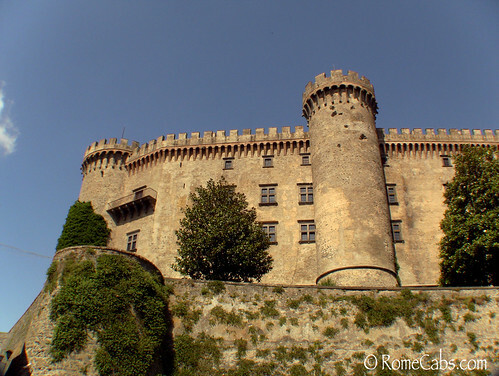 After a relaxing drive through the Roman countryside, you will arrive at the village of Bracciano where you will notice the large and imposing Odescalchi Castle that dominates the sleepy village. This 16th century castle is in remarkable condition and still owned by the Odescalchi family. Although privately owned, the castle is enjoyed by visitors on tours and hosts significant cultural events as well as high profile weddings. Your visit through the castle will take you through the castle rooms and halls rich in history, art, authentic centuries old furnishings, and fascinating legends with a stop up to the tower where you will be treated to a spectacular view of the lake. A drive to the lake shore will follow so that you can enjoy the dazzling beauty of Bracciano Lake from the promenade along the beach. A actual volcanic crater, this one of the most pristine lakes in Italy. Its lakeside beaches attract locals and visitors who prefer to relax, swim, sail, canoe, stroll, and generally escape the hustle of large cities like Rome. Your journey continues with a short drive to nearby Ceri. Ceri is a 13th century hilltop hamlet with reinforced walls that gives it the appearance of a medieval fortress isolated on top of a steep plateau. Its medieval past dominating the present reveals itself as soon as you arrive at the bottom of the hill. The only street that leads you into town is wide enough for only a single vehicle to pass through at a time. This unusual traffic problem was resolved with the installation of two traffic lights: one at the bottom of the hill, and one where the street ends in the main square above. Upon reaching the main square, you can visit the beautiful Sanctuary of the Madonna di Ceri, a Romanesque church built on top of an ancient temple where ancient Etruscans and Romans venerated the pagan goddess Vesta. This Sanctuary with stunning ancient and medieval frescoes is a very special place for the locals. The Virgin Mary for whom this Sanctuary is named is known for her intercession and helping people who are experiencing difficulties. After a delicious traditional Italian lunch, you will be given the opportunity to enjoy the charming town square surrounded by ochre and sienna colored medieval buildings aged by passage of time. Afterwards you will continue into the heartland of former Etruria to one of the most fascinating archaeological sites in Europe and a UNESCO World Heritage Site: the Banditaccia Necropolis in Cerveteri. One of the many fascinating characteristics of this necropolis is that it spans across 6 centuries of the Etruscan civilization, establishing it as the largest city of the dead in the Mediterranean area. You will walk through the progression of of history from early 9th Century BC Villanovan era where you will notice primitive pottery ossuaries, to elaborate hut shaped tombs carved from the actual tuff rock, and finally sophisticated city-like planning of 3rd century BC with roads used for funeral processions. You will see ancient cultural and architectural advancements unfold all around you as you explore centuries of history that once belonged to this advanced, yet mysterious, ancient pre-Roman civilization. Just a short distance outside of Rome into the lush countryside, you will discover some of Italy’s greatest historical and archaeological treasures peacefully nestled in the picturesque landscape that is nothing short of a slice of heaven. From here you will enjoy a relaxing drive through the countryside where your Rome hotel awaits your arrival. We thank you for choosing Stefano Rome Tours for your tours and shore excursions in Rome and beyond, and we wish you safe and happy travels! * This Castles and Lakes Post Cruise Tour is not offered on Mondays. Banditaccia Necropolis in Cerveteri is closed on Mondays. * The price of the tour includes private deluxe vehicle with an English speaking driver, VAT tax, fuel, insurance, tolls, and transfer from Civitavecchia Cruise Port. * The tour price of this tour does not include entrance fees, private tour guides, lunch, gratuities, or other client personal expenses. * The price for the tour listed is per vehicle. Individuals may split the cost of the tour among themselves. * Please allow up to 24-48 hours for email inquiry replies and service confirmation. * Entry ticket for Odescalchi Castle is currently 8.50 Euros per person. Tickets can be purchased upon visiting the site. PRIVATE TOUR OF THE CASTLE: Odescalchi Castle also provides upon advance reservation an Private Guided Tour in English at 120 Euros including entry tickets. Please inform us upon booking this tour if you wish to have a private tour guide booked for you. Otherwise you can tour the castle on your own. * Entry ticket into Cerveteri Baditaccia Etruscan Necropolis is currently 10 Euros per person. Unless you request for us to book a private guide for you at the rates that licensed tour guides charge, you will visit the necropolis on your own as your driver is not lawfully permitted to accompany you into the site. 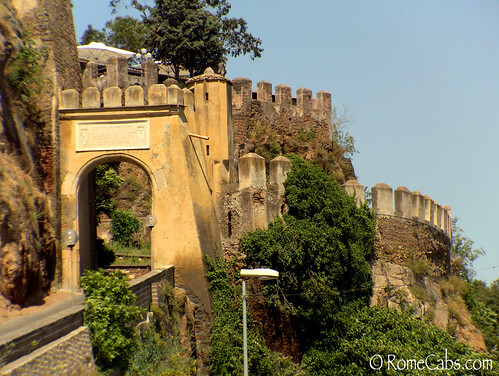 PRIVATE TOUR OF THE NECROPOLIS: Please let us know if you wish to hire a private tour guide for your Cerveteri Necropolis visit. Licensed tour guides charge 150 Euros for 2 hour private tour. * Current Ticket prices are subject to change at the discretion of the sites and monuments. Ticket Prices and changes inside attractions can happen without advance notice and are beyond our control. * You can save a lot on this Shore Excursion by sharing your tour with up to 8 other cruisers per minivan! It’s very easy: just place an ad on the Cruise Critic roll call and invite others to join you. * Payment to be made in Euro currency at the end of your tour directly to your driver, or you may prepay in advance via PayPal. Please let us know when the tour is confirmed that you wish to prepay and just enjoy yourself on the day of your tour. * This tour provides a Driver who is NOT a licensed tour guide, therefore cannot by law accompany guests away from the vehicle to sightsee inside the castle or the necropolis. Your driver will be obliged to remain with the vehicle while you sightsee. * If you are pleased with the service you receive from your driver, 10-15% gratuity is customary in Italy and greatly appreciated. * LUNCH is available only in Ceri. Please note that in Ceri there are only local restaurants, no panini or pizza places. Depending on what you order, the average is 20 Euros per person for lunch at any restaurant you choose in Ceri. You must be in agreement to lunch in Ceri at any of the available local restaurants in order to participate in this tour. We will not ask for your credit card information to reserve a service or place a deposit. We operate on the Honor System, so we simply ask that all cancellations be made at least 7 days in advance so we can rebook your service and your reserved driver does not lose work for that day. Cancellations must be made via email and confirmed by us so we have it on record. We do not accept cancellations by telephone, text message or 3rd party. Thank you for your cooperation. * Please wear comfortable clothing and shoes on this tour as you will encounter uneven terrain in the Banditaccia Necropolis. * If you have trouble walking on uneven terrain, this tour may not be suitable for you. * This tour is created for the experienced cruisers who are interested in culture, history, architecture, nature and Italian slow food. 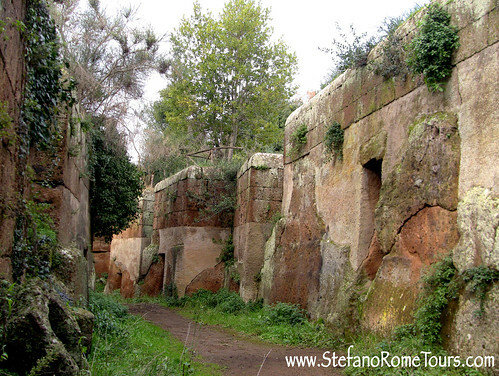 * Click here to read more about Cerveteri Banditaccia Necropolis.